What do you feel you can offer as a mentor. The first role of a mentor is to offer a listening ear to help you make sense of any situation or issue in your coaching that you want to explore, and from there work out together what would be most helpful to you. I can offer you a confidential and supportive environment in which you can openly discuss any coaching issues that you want to share. With experience of coaching and club roles, I can help you to work through the options open to you, access appropriate training, and support you to develop a plan for you to action. This might help you to overcome communication difficulties that are affecting your coaching, or build coaching relationships. You might want to recruit new members for your activity and not know where to start. Or you might want help working out where to take your coaching from here and how to develop yourself. I came to sport late, at the age of 40 and married with 2 children. I came across triathlon and loved the challenge, camaraderie and fun. Open water swimming has been a great experience: swimming several of the English lakes up to 5 miles and completing a year long challenge to swim a mile a day have been particular highlights for me. I've mainly competed in Sprint distance triathlons (400m swim, 20km bike, 5km run), and some standard distances (1500m swim, 40km bike, 10km run). The great thing about triathlon is the variety of training for 3 disciplines, as well as the practicalities of transitions and the mental challenge of the whole event. My focus areas of coaching have been open water swimming, and engaging people of all ages and at all ability levels to get out there and give triathlon a go. I believe strongly in the value of keeping active for mental and physical wellbeing and the area of sport psychology is a particular interest. With a background in marketing, my focus has always been on people's needs. I enjoy analysing a situation to identify goals, options for progress, and supporting individuals along the way to achieving their aims. I look forward to helping you on your projects. 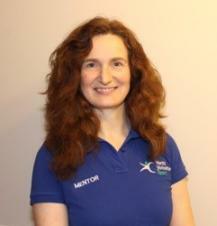 I coach triathlon (primarily swimming) in York, and tutor coach education courses for British Triathlon nationally. I am currently studying for a PhD in the area of coach learning and development at Leeds Beckett University. I previously worked in marketing and consumer research with Nestle, Britvic and Homepride foods.